I often wonder about food, its origin and who discovered how different combinations of ingredients create something wonderful. Baking, for example, is a proper science to get right and must have taken years to develop and perfect. I also wonder if ‘Mr Lasagna’ (as I like to imagine he is called) would ever have dreamt his creation is loved on a daily basis around the world! We are very lucky these days to have access to so much incredible knowledge and inspiration of dishes. I for one have hundreds of cook books that I read front to back like a novel and try and soak up skills and inspiration from others. When I purchase delicious fresh ingredients that I’m not so familiar with, I will often jump online for some ideas of how to cook it and what works flavour wise. That is what happened with this recipe. I bought some incredible fresh scallops from the market, and having rarely cooked them (and spent a fair whack on them) I didn’t want to mess them up! One of my go-to websites for inspiration is www.greatbritishchefs.com, which I highly recommend for any experimental chef out there. This site not only has a catalogue of recipes from the best chefs Britain has to offer, but also really handy skills advice, restaurant reviews and decent giveaways (not that I’ve actually won anything from it before!)! For the puree, place a small-medium saucepan over a medium head with a splash of oil. Add the parsnip and the spices and then reduce the heat and cook for 40 minutes, until the parsnips have softened. This will need stirring regularly so as not to burn or get stuck to the bottom of the pan. Once softened, add the cream and the milk and bring to a simmer for a further 5 minutes. Remove the sauce from the heat and blend until smooth. Transfer the puree to a clean saucepan and season to taste – cover until ready to re-heat and serve. For the pomegranate dressing, reduce the pomegranate juice down in a pan until you are left with roughly 100ml. Remove the juice from the heat and tip into a deep bowl. Quickly whisk in the rapeseed oil and set aside in a bottle until ready to use. (you will find you don’t need all of this but it can be use over the next couple of days as a delicious salad dressing). To make the parsnip crisps – peel into long strips, avoiding the core and pat dry on a little kitchen paper. Set aside until ready to cook. Once ready to cook, preheat a deep pan of vegetable oil to 180˚C and deep-fry the strips for 3-4 minutes, or until golden, then remove from the oil, drain on kitchen towel and season with salt. – Keep in a warm, dry place until required. Make sure your scallops are cleaned and stored in the refrigerator on a clean tea towel or J-cloth before cooking. To prepare the scallops, season lightly with salt. Meanwhile, begin to reheat the parsnip purée. Arrange spoonfuls of the parsnip purée around each plate, then top each mound of purée with a scallop. 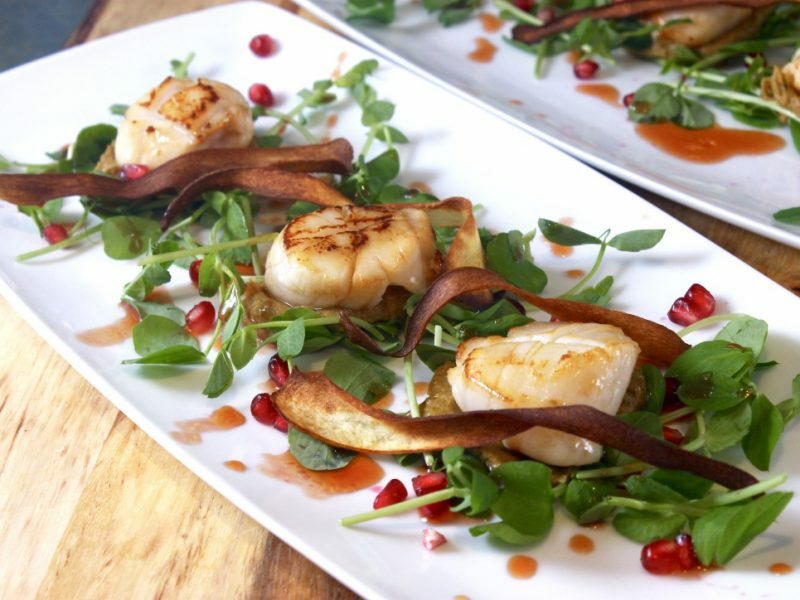 Garnish with the seeds, crispy parsnips and watercress and drizzle over the pomegranate dressing. Serve immediately and enjoy! I seldom make scallops, too – but you’ve done it wonderfully! Thank you for sharing your successful experiment!